Answer: Neither of them. It’s a trick question. So…this last Monday that just happened, there was a Pentatonix Christmas special on TV, and the report was that Kermit was going to make an appearance. I debated with myself about whether or not to watch it, and ultimately I compromised with myself that I would watch it, but only with the sound down and the captions on. And I hoped that Kermit would appear early on, because watching a musical program with the sound down didn’t really appeal to me. But seriously, I think Matt is great…as Uncle Deadly. His Kermit, though…sheesh. Okay, that sounds harsh. I’m sorry. I usually don’t go for the joke at the potential expense of other people’s feelings like that. I’m just feeling bitter and, well, it was right there. I said at the beginning that if Disney insisted on this course of action and refused to be dissuaded, Matt was an excellent candidate to play Kermit because of his talent and his ethos. But having actually heard Matt do it…I’m sure it’s NOT something that he’s doing on purpose, but Matt’s Kermit sounds too much like Constantine. HOW CAN I TRUST A KERMIT THAT SOUNDS LIKE CONSTANTINE?!?!?!?!? If I may paraphrase my thesis statement from my review of the first episode of the muppets. (2015), this video made me want to cry…and NOT in a good way. And I reiterate again, this is nothing against Matt. But just as a Doozer can’t become a Fraggle, Matt cannot become Steve. It’s not a bad thing, and it’s nobody’s fault. It’s just the immutable laws of nature; they’re there for a reason. And I have my doubts as to whether a Constantine can become a Kermit…but, in fairness, I suppose it is a little soon to judge. I remember when Muppet Christmas Carol was about to come out back in 1992. I was talking to my eldest brother about it, and he said that he couldn’t bear to watch it because, regardless of how close the voice was, he would just know that it wasn’t Jim Henson performing Kermit. And I don’t think that that was supposed to be a slight against, or a criticism of, Steve in any way (I’m not entirely sure that my brother knew specifically that it would be Steve performing him–I certainly didn’t); I just think that the wound was still too fresh. At the time, I rather thought that my brother was cutting off his nose to spite his face in regards to the Muppets. Just because Kermit was different doesn’t mean he would be bad, and my brother might have been missing out on something great. But now…I kind of get where my brother was coming from. I don’t know–I sincerely don’t know–if I’ll ever be able to bring myself to watch new Muppet stuff ever again. And I reiterate, yet again, that it is nothing in the world against Matt; if it be so that he is not purposely trying to be bad, I am sure he will get better over time, just as Steve did. But it’s something that he should never have been asked to do in the first place–certainly not under these circumstances. At the risk of sounding like Sarah in Labyrinth, it’s just not fair. It’s not fair to Steve, to Matt, to Jim, to Kermit, the other Muppet performers, or to us fans. The whole thing is just so contrived, so corporate…so artificial, so unnecessary…so WRONG!!! I’m sick of trying to be diplomatic about this; this whole thing is WRONG! It is WRONG to casually and cavalierly sever Kermit’s connection to Jim like this. It is WRONG to rip Kermit’s soul away from him! I’d like to believe that the ideal spirit of Kermit exists somewhere on the platonic plane, so that he will continue to live no matter who’s performing him…but I’m not sure I believe that anymore. If this had been a necessary course of action, and if Steve had been allowed input into the decision, then maybe the spirit of Kermit could continue to flow on through Matt (or whomever Steve had chosen) and into the puppet. But maybe the circumstances have to be exactly right; maybe it can’t happen when the decision is made arbitrarily under false pretenses. I don’t know. All I know is that today has been an awful day. And I feel so bad. 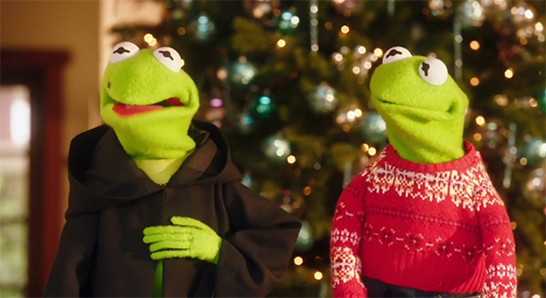 Neither Constantine nor Matt Vogel can give me what I want: I want Steve back as Kermit. Only Disney can give me what I want, but I don’t believe their promises are any more sincere than Constantine’s are.